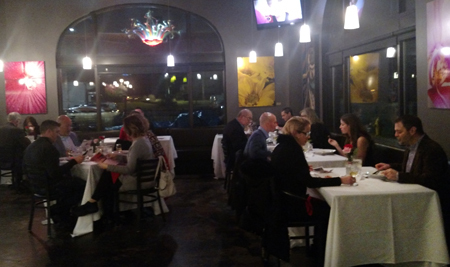 The crowd at the Valentine’s wine dinner at Uptown Kitchen on Saturday, February 11, 2017. Wow! What a great event. 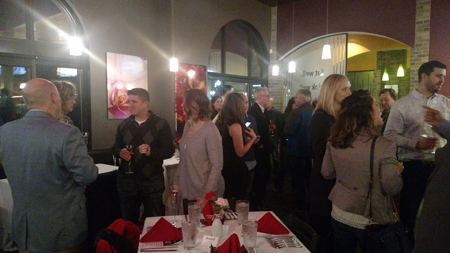 Last Saturday evening Uptown Dining Group and the Tiedemann On Wines Wine Club hosted Uptown Kitchen’s 9th annual Valentine’s Wine Dinner. More than 70 people attended our seven-course dinner starting with a reception at 6:30 pm where everyone had the chance to taste a special Winter Mimosa. Guests were seated around 7:00 pm for dinner. Sitting down to dinner at the Uptown Kitchen wine event. Here is a quick explanation of a wine dinner: a meal where every course is paired with a wine of some type. We generally start the meal with lighter, more delicate flavored foods and wines, and end with bolder, more intense foods and wines. Why do we use this format? The reason is that throughout the entire meal our sense of taste becomes dulled from all the flavors. Thus we serve the heavier foods and bolder wines towards the end of the meal as they are enriched with heavier tastes and flavors. That is also why many popular desserts are so rich and intense, and served at the end of the meal. Although a lot of us would easily eat our desserts at the beginning of the meal. 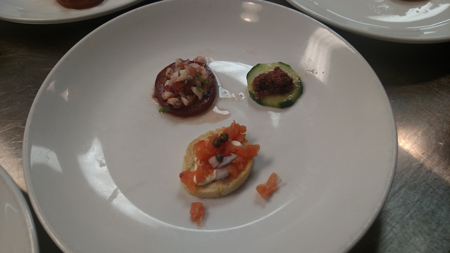 1st Course: Canapes trio: Cucumber with olive tapenade, tomato with ceviche, smoked salmon crostini. Paired with the 2012 White Oak Russian River Chardonnay. 2nd Course: Arugula, pear and asiago salad, roasted walnuts, white balsamic and olive oil drizzle. Paired with the 2013 Glenwood Cellars Sauvignon Blanc. 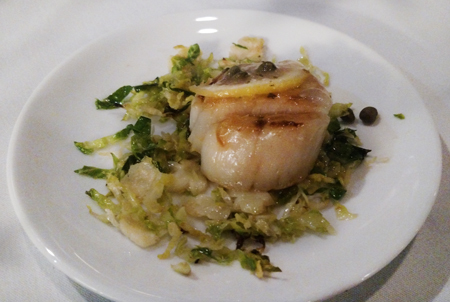 3rd Course: Seared scallop with lemon butter sauce, chiffonade of garlic sautéed Brussels sprouts. 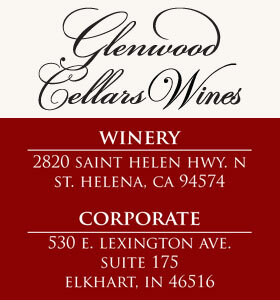 Paired with the 2012 Glenwood Cellars Chardonnay. 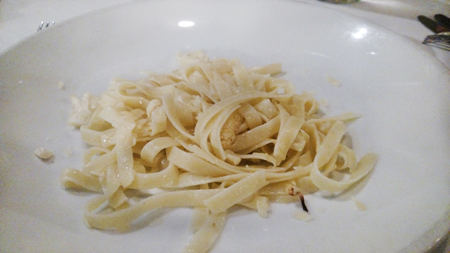 4th Course: Fettuccine with roasted cauliflower and shaved parmesan. Paired with the 2014 Glenwood Cellars Pinot Noir. 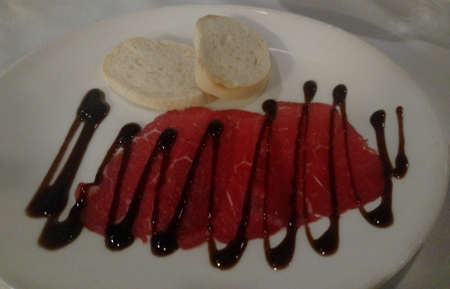 5th Course: Beef carpaccio, shaved parmigiana-reggiano, toast points, balsamic drizzle. Paired with the 2013 Legenda Aurea Primitivo Cabernet. 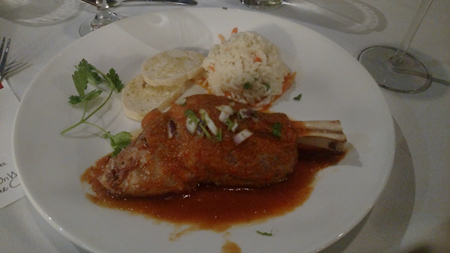 6th Course: Roasted lamb shank, rice pilaf, salsa birria, garlic bread. Paired with the 2012 Three Clicks Petite Sirah. 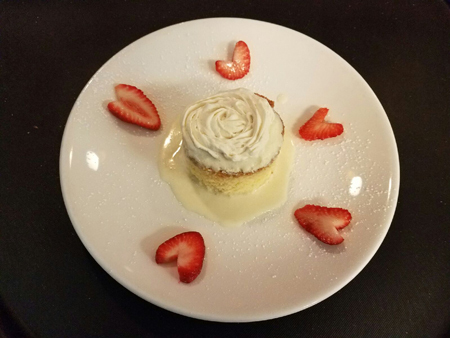 7th Course: Tres leches cake, strawberries. Paired with the 2010 Torre De Barreda Pañofino. The wines were a mixture of Old World and New World wines. The Old World Wines were an Italian Primitivo Cabernet and a 100% Tempranillo from Spain. The New World wines were all California favorites – Chardonnay, Sauvignon Blanc, Pinot Noir and a Petite Sirah. I felt each wine paired well with each of the chef’s dishes, making for a wonderful evening of food and wine. In August of this year Uptown Kitchen will be celebrating its 10th anniversary with a very special wine dinner. We will let you know all the particulars on this event as soon as we can. Looks like you had a wonderful evening…the food and pairings appear outstanding. In the future, please do not schedule these great events when I am out of town. Dana and I will leave August open so we won’t miss the 10th Anniversary party. Thanks Tom. You and Dana were missed. But I am sure that you had an equally good time in SC!! Looking forward to seeing you guys soon. Carl, thanks again for your continued partnership and more importantly, your friendship. I truly enjoy sharing great food and wine with you! To many more opportunities to celebrate, cheers!